MICHEL, NATAL & SPARWOOD, B.C. And to darkness will return." From "Piercing the Coal Quilt" by James B. Goode, 1993. These coal mines were established 100 years ago in the Crows Nest Pass and have been cruel to the men who chose to make a living in them. Miners went into the tunnels every day with the uncertainty of seeing the light of day at the end of their shift. 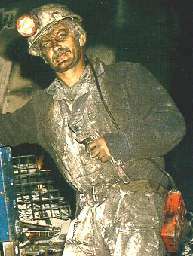 Working in the mines was quite dangerous with men losing their lives in almost every year for the first half of the century. As you can see from the list, the majority of the fatalities occurred in the years up to 1970. This was about the time that the underground operations were starting to be phased out. The worst coal mining disaster in Canada occurred on the Alberta side of the Crows Nest Pass at the Hillcrest Collieries, where, on Junes 19,1914 an explosion took the lives of 189 men. They are buried in a mass grave in the Hillcrest Cemetery. 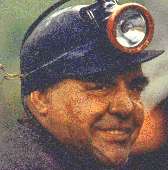 There were many causes of injury and death in the mines. 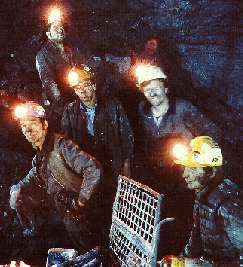 Among them were: the ignition of coal gas (methane) which killed by explosive force and/or poisonous gases; roof falls (cave-ins); runaway coal cars (known as trips); bumps (when underground geological forces cause the roof and floor of the tunnel to squeeze together); and the hazards of working with dangerous machinery. In the early years of mining the men went into the tunnels with only a small, weak open flame as their light source. It was possible to only see a few feet in front of them. Along with the dangers of poor visibility, the open flame could ignite the deadly methane gas at any moment. The life of the miner was lived perilously close to the edge. This page is in Remembrance of all the men who died in the coal mines of the Michel-Natal, Sparwood & Elkford area. All names have been copied from the Miners' Memorial book which is located in the Sparwood Public Library. The list was compiled in conjuction with the unveiling on June 4th, 1995 of the Miner's Memorial in Sparwood's Centennial Square. These 12 men were all killed in series of explosions which occurred shortly after the start of night shift on August 8, 1916. At the time there was a bad lightening storm taking place. It is thought that the lightening struck near the portal and travelled into the mine either on the signal wire (bells used to communicate in the mine), the cable used to pull coal cars, or along the track itself. The main entry way was constructed of 18 to 24 inch diameter timbers which were smashed and strewn all about in front of the portal. When the mine rescue team went into the mine the gases were still quite toxic and they used safety lamps and they took canaries with them to detect the deadly gases. They also found a horse dead in the tunnel and they used this to try and find Daniel Hall the hoistman who would have been driving the horse. Thomas Phillips was the fireboss, Peter Hrbka the timberman, Sam Dmytriv the rope rider, Mike Marmol the bratticeman, and the rest were all miners and labourers. All of these men except for Antonio Colosimo, were killed in the Balmer North Mine Explosion and are commemorated on a separate web page. 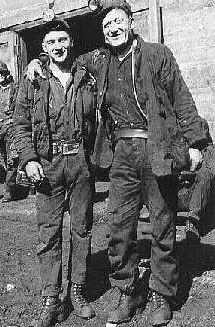 My dad, Fred Venzi, on the right, and his friend, Joe Mirkovich. This page is also to commemorate men like my father, who went to work every day and returned home again, leaving part of their souls in the mine. As the son of a coal miner, I know the fear that families lived with daily as the men left home for work. We could never feel sure of their returning home again. The list of men who did not return shows the fear was well founded. The men knew that at any moment their life might be in the hands of their fellow miners. Men have been trapped for hours or days with the knowledge that their only hope was that the men they worked with would dig them out. This required that they have a great deal of trust for each other. Although all the miners worked hard in dangerous conditions, they had some fun too. After work, they would often talk of the pranks that they played on each in the mine. They developed a camaraderie that is hard to describe, and most of them would not have wanted to work at anything else. Balmer North Mine Explosion This page commemorates those killed in the 1967 explosion at Michel, B.C., Canada. Hillcrest Mine Disaster This site commemorates the 189 men killed in Canada's worst coal mining disaster which occurred on June 19th, 1914. Crowsnest Coal This British Columbia site is part of The Crowsnest Pass Railway Route, written by historian Robert D. Turner. This site is produced by the Cranbrook-based Canadian Museum of Rail Travel and is an excellent source of information about this area of western Canada. Be sure to visit the Coal Creek Mine Disaster of May 22, 1902 which tells the tragic story of one of the worst mining disasters in Canadian history. District of Sparwood This British Columbia site deals with the geological and social history of the area and includes many interesting photos. The Experiences and Observations of a Canadian Spitfire Pilot in World War II This page by Canadian RCAF Spitfire pilot, Stephen Butte, DFC, is the transcript of a memorable address which the author gave at the Halifax Royal Canadian Legion, Branch 25, on November 6th, 2001. Stephen Butte comes from Natal, B.C., and he is one of the veterans honoured on the District of Sparwood's Memorial Site above. Sparwood Public Library Visit this site for information on the Sparwood area and the history of Natal and Michel. Fernie Museum Be sure to visit this site for information on coal mining in the Fernie area. Coal Dust Grins: Portraits of Canadian Miners This Canadian site, which is a part of Cambria Publishing, showcases the work of the renowned Albertan photographer and author, Lawrence Chrismas. British Columbia Archives This provincial government site allows on-line access to many of the Archive's holdings and provides an on-line search service for births, deaths and marriages (click on "Vital Events"). Trails B.C. : The Trails Society of British Columbia This site, developed by Murphy Shewchuk, provides a wealth of information on trails throughout the province. To find information on the trails in the Crows Nest Pass area look under "Rocky Mountain Region". Frank Slide Interpretive Centre The center focuses the history of the Crowsnest Pass and is an excellent source of information on area coal mining and the Hillcrest Mine Disaster of 1914. The Meadow Colliery: The History of Mining in Coalbrookdale, Telford, Shropshire This site written by Allan Phillips, focuses on the history of the coal-mines of Madeley, Shropshire where coal has been mined since the thirteenth century. United States Mine Rescue Association Homepage This Pennsylvannia-based association is dedicated to improving mine safety through improved training. USMRA's website features a wealth of information on mining and safety issues as well as current news items, photos and mining music. Membership in USMRA is free and the association welcomes members from around the world. Thanks to the Sparwood Public Library and librarian, Jim Bertoia, for their help in preparing these pages. I would also like to thank Gwladys Borsato for all her time spent scanning pictures. Fernie Free Press, August 11, 1916.